NALC President Fredric Rolando has appointed Director of City Delivery Brian Renfroe as executive vice president effective Dec. 5. Region 1 National Business Agent Christopher Jackson will become director of city delivery on Jan. 2. The NALC and USPS have agreed to renew three MOUs: Re: Full-time Regular Opportunities – City Letter Carrier Craft, Re: Sunday Delivery – City Carrier Assistant Staffing, and Re: Signing Overtime Lists. In Las Vegas, NALC held another Branch Officers Training session, tailored to help elected branch leaders learn more about their roles and duties. As called for by our Constitution, NALC held a national conference (or “rap session”) in Houston July 17-19 for state association and branch presidents. Everything about NALC’s administration is focused on service its members. Its governing structure is designed to maintain the union as a strong national advocate while ensuring local interests are served. The NALC Constitution sets the governance structure for the national organization, including national officers and local branches. It spells out election procedures, officers’ duties, convention responsibilities, and other key matters. Each NALC member is also a member of one of more than 2,000 local branches. NALC’s branches are the heart and soul of the union. Like “locals” in other unions, branches are where NALC members get information about both local and national issues, voice their opinions at meetings and coordinate union activities, from advocacy efforts to charitable and social events. You can look up contact information for branches and regions in the map below. Fifteen elected national business agents (NBAs), each responsible for one of 15 regions of the country, serve the members and branches in their region. An NBA’s primary responsibility is contract administration—handling grievances, presenting arbitrations, and dealing with regional postal management. They also deal with organizing and respond to requests for advice and assistance from branches in their regions. You can see a map of each branch and region in the map below. The NALC is led by 10 resident national officers and three national trustees who are elected by the membership to four-year terms. Current terms of office run until December 2018. The officers and trustees have specific responsibilities as outlined in the NALC Constitution. 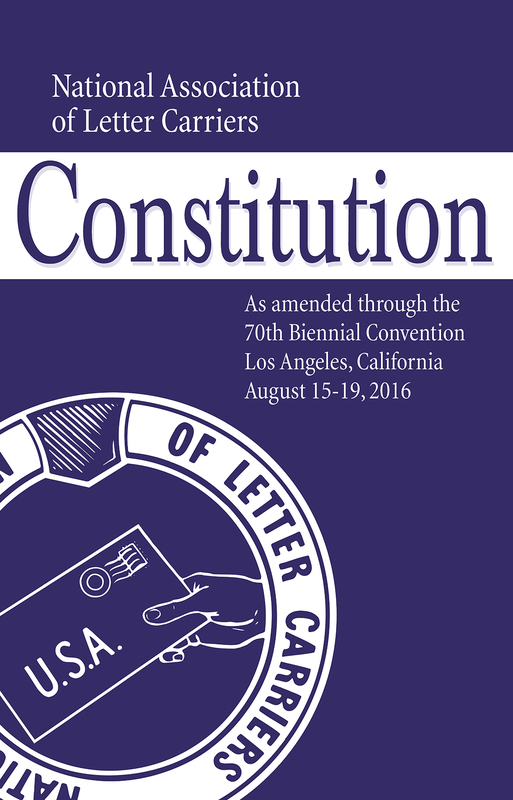 The NALC Constitution requires the organization to convene a national convention every two years. The convention is the supreme governing body of the NALC, and its powers include amending the Constitution, setting overall union policies and nominating candidates for national office. Delegates are elected by branches. The national officers listed below have essential roles in the administration of NALC from its Headquarters in Washington, DC. They assure that the officers and staff at Headquarters and in the branches throughout the country have the resources they need to serve the union’s members. The duties of the executive vice president include recruiting new members, overseeing NALC’s Leadership Academy and promoting letter carrier participation in the Customer Connect program. The duties of the secretary-treasurer include assisting and overseeing branch activities such as tax exemption and filing, finances, elections and mergers, upholding member rights under the Labor-Management Reporting and Disclosure Act and dues payment. The duties of the assistant secretary-treasurer include assisting and overseeing changes branches make to their bylaws and hosting member visits to Headquarters. Click here for the list of national officers.